Interleaving is a fruitful strategy for learning. Interleaving is a powerful strategy that boosts learning by mixing up content students need to learn. Based on a wealth of cognitive science research, the challenge and "desirable difficulty" of interleaving can double exam performance compared to teaching content in "blocks" of the same concepts. But what's the secret to effective and fruitful interleaving? Mix similar topics. This week, read more about why and stay tuned for next week, when we'll share quick how to's. How do you use interleaving? Share your tips with our community on Twitter and Facebook. P.S. We need your help! Could you share your feedback with us? 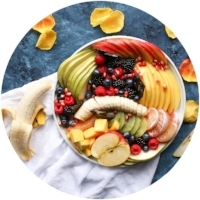 When it comes to interleaving, mix up similar concepts, similar to a fruit salad. This analogy from one of our readers, Betty, helps put into context a critical component of interleaving: students have to discriminate and choose the correct concept or strategy when we mix up similar topics. They have to differentiate, reflect, and create an understanding of the similarities and differences between related topics. Besides, why mix fruits and vegetables together, when you can easily pick out one out from the other? Keep in mind that simply mixing things up doesn’t mean it’ll be beneficial for learning. One study indicated that mixing up different course subjects – for example, anatomy and foreign language vocabulary – doesn't increase learning. Why not? Simply because this doesn’t involve discrimination; the content areas are too different. Next week, we'll feature quick teaching strategies using interleaving. In the meantime, check out our overview of research and strategies on interleaving, as well as our Interleaving Practice Guide. 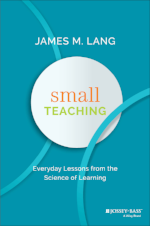 In this book, James Lang presents an approach to improving teaching in higher education through small but powerful modifications, based on strategies from cognitive science. In this article for educators, John Dunlosky condenses 100+ years of cognitive research on 10 specific learning strategies, including retrieval practice and interleaving. In this peer-reviewed journal article by Kelli Taylor and Doug Rohrer, 4th grade students who completed interleaved math problems had nearly double the exam performance after one day (77%) compared to students who completed blocked math problems (38%).